Thanks to its exclusive blend of 8 natural anti-ageing botanical ingredients, Patyka's Youth Remodeling Rich Cream corrects ageing signs and extends the skin’s youth capital. The skin recovers the suppleness, firmness and radiance of its youth. It becomes more resistant and its elasticity is improved. Even the deepest wrinkles are diminished and smoothed. Organic anti-wrinkles and firming rich cream for dry and mature skin types. HORDEUM VULGARE STEM WATER*, AQUA (WATER), CAPRYLIC/CAPRIC TRIGLYCERIDE, C10-18 TRIGLYCERIDES, CETEARYL ALCOHOL, ALCOHOL** DENAT., BUTYROSPERMUM PARKII (SHEA BUTTER)*, DIGLYCERIN, SQUALANE, DICAPRYLYL ETHER, GLYCERYL BEHENATE, GLYCERYL STEARATE, PARFUM (FRAGRANCE), GLYCERIN, GLYCERYL STEARATE CITRATE, POTASSIUM PALMITOYL HYDROLYZED WHEAT PROTEIN, GLYCERYL CAPRYLATE, SODIUM COCOYL GLUTAMATE, FAGUS SYLVATICA BUD EXTRACT*, LEVULINIC ACID, SCLEROTIUM GUM, CHONDRUS CRISPUS (CARRAGEENAN) POWDER, SODIUM LEVULINATE, XANTHAN GUM, CITRIC ACID, SODIUM HYALURONATE, POTASSIUM SORBATE, SODIUM BENZOATE, HEXAPEPTIDE-11, AVENA SATIVA (OAT) KERNEL EXTRACT**, SODIUM HYDROXIDE, PSEUDOALTEROMONAS FERMENT EXTRACT, SODIUM PHYTATE, BENZYL ALCOHOL, BIOSACCHARIDE GUM-1, ALTEROMONAS FERMENT EXTRACT, PHENETHYL ALCOHOL, UNDARIA PINNATIFIDA EXTRACT, CITRONELLOL, GLUCOSE, LINALOOL, SODIUM ANISATE, SALICYLIC ACID, BENZOIC ACID, COUMARIN, ALCOHOL, TOCOPHEROL. Apply a dollop of the Youth Remodeling Rich Cream on cheeks, forehead, neck and neckline using smoothing gestures. In order to increase its efficiency, preceed with the Advanced Plumping Serum. It's a perfect match ! Fruit of years of research and daily toil to highlight what it means "to feel beautiful", Patyka creates a harmonious blend of beauty, pleasure, efficiency and responsability. 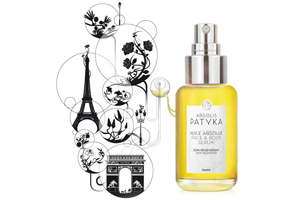 Discover the luxury organic beauty world of Patyka for a remarkable and chic beauty ! Ecocentric is an online luxury organic beauty concept store offering the best in made in France premium natural face skin treatment products. A unique and exclusive organic and natural face care brands selection to buy a natural moisturizing day cream, an organic nourrishing face beauty oil, a natural hydrating skin care product, an organic facial moisturizer.